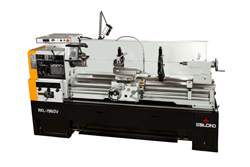 Save up to 15% on a RKL 1900, 2100, 2500 or 2900 Series manual lathe until December 31, 2015. Now is the time to buy to gear up for a busy 2016. Interest rates are low and LeBlond provides the option of machine tool financing. It is logistically difficult to park a manual machine tool weighing over 4,500 pounds under your holiday tree; but nevertheless, LeBlond Ltd. is in a generous spirit at the end of the year, announcing a holiday promotion last week on heavy-duty manual lathes. Customers can save up to 15% off or as much as $9,600 off list price on a heavy-duty RKL metal lathe until December 31, 2015. Prices start at $20,665. Customers can select either a gearhead or variable speed RKL 1900 model engine lathe with a 20” swing and either 40 or 60” distance between center as well as a RKL 2100 model with a 22” swing with a range of 60” to 157” of distance between centers. The RKL 2500 and RKL 2900 are the larger of LeBlond’s heavy-duty precision lathes. Like the RKL 1900 and 2100, they are available in variable speed or gearhead models. The RKL 2500 features a 26” swing while the RKL 2900 is equipped with a 30” swing. Both models offer a range of 60” to 157” of distance between centers. All LeBlond lathes are equipped with a wide bed of Meehanite casting that is vibration stress relieved for maximum durability. Heavy Duty tailstocks with available pneumatic power operation. LeBlond lathes feature standard accessories like taper attachment, follow rest, steady rest and splash guard that our competitors charge for. With their holiday bonanza, LeBlond aims to provide machine shops and other manufacturing hubs with a heavy-duty manual lathe that has the precision and reliability that are hallmarks of the LeBlond name. More on the Company: LeBlond Ltd. is the only company in the world with both OEM replacement parts for LeBlond and Standard Modern lathes, K.O. Lee grinders and mandrels, Johnson Presses and Deka Drills. LeBlond sells new machines, rebuilds equipment and offers world-class accessories and tooling items. For a trusted legacy since 1887, contact LeBlond for all your machine tool needs.